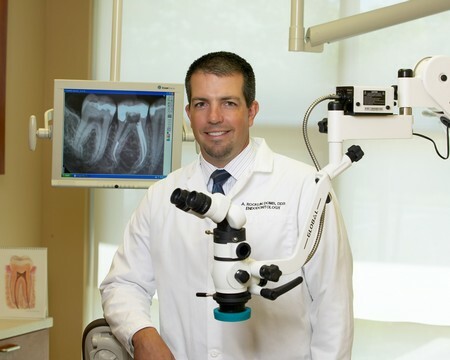 Thank you for selecting the endodontic office of Dr. A. Rocklin Doms, an endodontic specialty practice dedicated to exceptional care using state-of-the-art technology. Dr. Doms, or "Rocky," received his B.S. in Biochemistry from UC Davis (graduating in the Phi Sigma Honor Society), attended dental school at UCSF, then completed his endodontic residency at Temple University in Philadelphia, PA. He is a member of the American Association of Endodontists and is an Assistant Professor at UOP School of Dentistry in San Francisco. Please feel free to learn more about our practice and services we provide our patients by choosing a topic from the list above. If you have any questions, we may also reached by telephone at (530) 750-3636, or by email at info@domsendo.com. This practice utilizes many of the newest technologies available in dentistry for your treatment. We use special operating microscopes, adapted for dentistry, during all phases of your endodontic treatment. These precise instruments allow us to visualize fine details, up to 20x the magnification of the naked eye, inside your tooth. We also use digital radiography to take films of your teeth, which can be viewed on monitors in each treatment room. Also, our dental software allows your dentist to view all phases of your treatment via computer, as well as allowing you to register and update all information at your convenience online at anytime.